The other day, having lunch with friends at IKEA (because every furniture store should have a cafeteria in it, especially one licensed to serve alcohol), I noticed that they had a pasta special on for a great price. I immediately wanted it – I love pasta – but of course, it was pasta made from wheat flour, which is not me-friendly. 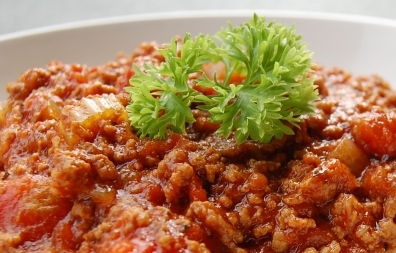 But the sauce looked sooo good… thick, rich tomato sauce, with chunks of vegetables and sausage meat. I could smell it, standing in the cafeteria line, and I really wanted some. 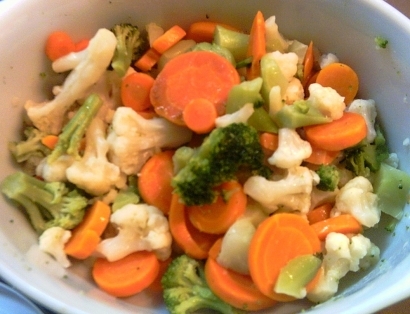 The Vegetable of the Day, I saw, was a blend of carrots, cauliflower, and broccoli, sliced into bite-sized pieces and steamed. I could see from the way it looked that it would be crisp-tender, not overcooked; a perfect texture. When my turn came, I asked the woman behind the counter, “Can I have a plate of the vegetables, with the pasta sauce on top?” She looked at me as though I’d ordered a bowl of raw chicken with a side of carrot pudding. But she dished me out some vegetables on a plate, and slid some of that delicious sauce on top. You know… it was really good. It was beyond good. The sauce really was delicious, much better than you’d expect to find in a cafeteria line; and the vegetables had the tender-crisp texture and a sweetness that went so well with the sauce. I didn’t miss the chewiness of pasta, which is really the thing I like best about pasta, because the vegetables filled in the texture component nicely. And the flavour of all of it together made it a real feast. To put icing on the cake – so to speak – they hardly charged me anything for it. Next time you make or buy your favourite pasta sauce, even if you’re not wheat-intolerant or gluten-free, consider adding to your nutritional count and losing some calories. You don’t need no stinkin’ grains to enjoy that delicious pasta sauce. Have veg instead! Sounds lovely but I wouldn’t know how to cook it. Did you check your ikea? i had a broccoly pesto too before, i guess pasta and veggies can get along together…. This entry was posted on May 24, 2013 by thinkreadcook and tagged cooking, food, gluten-free, health, healthy, nutrition, pasta, recipe, sauce, vegetables, wheat, wheat-free.